At Wink Bingo we turn up the fun by throwing fab prizes into the mix. Our players win wadges of cash in our Jackpot games. You too could win a tenner, or ten thousand. In our Progressive Bingo Jackpots, the sky’s the limit! Guaranteed Jackpots have set prizes that also include physical goodies. How about a new LCD TV or the latest iPad? Too good to be true? Don’t take our word for it. 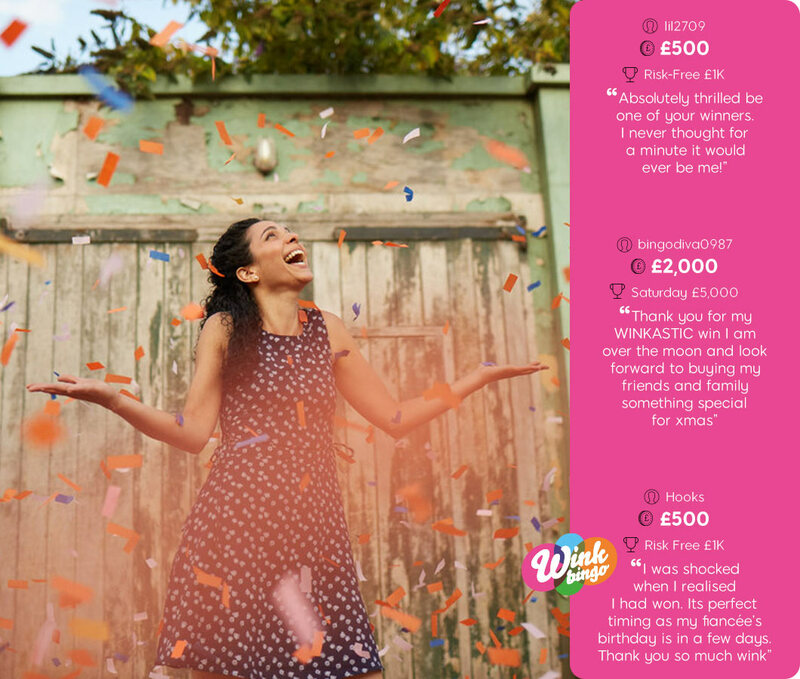 Read these winning stories from Wink Bingo players. Find out what they won and how they went about it. I felt amazing when I found out I won. Had a lovely meal out today to celebrate the win Paid for some large games next week and will be spending the winnings on the fees for our new home we are hoping to purchase. OMG im over the moon i have never won anything like this before! Thank you so much, I will be recommending wink bingo to all my friends now! Keep up the great work. The 888 sites are all awesome x "
“A FABULOUS WIN - "THANK YOU" WINK BINGO!! “I am very new to winks bingo. My friend who is a regular on the site introduced it to me to it ..my winnings came after my first ever punt on the bingo. I opened up my email to discover that id won. This was at 5 o’clock in the morning before I left for work. I couldn’t believe it I got so excited I woke up my wife.. she wasn’t best pleased as it was so early in the morning. She thought I was joking. You’ve seen the evidence Being a winner doesn’t have to remain a fantasy. There are small and large prizes to be won, every day. No matter who you are or where you are, you can play Wink Bingo games, have a great time and win some great prizes. What more could you ask for!